1. 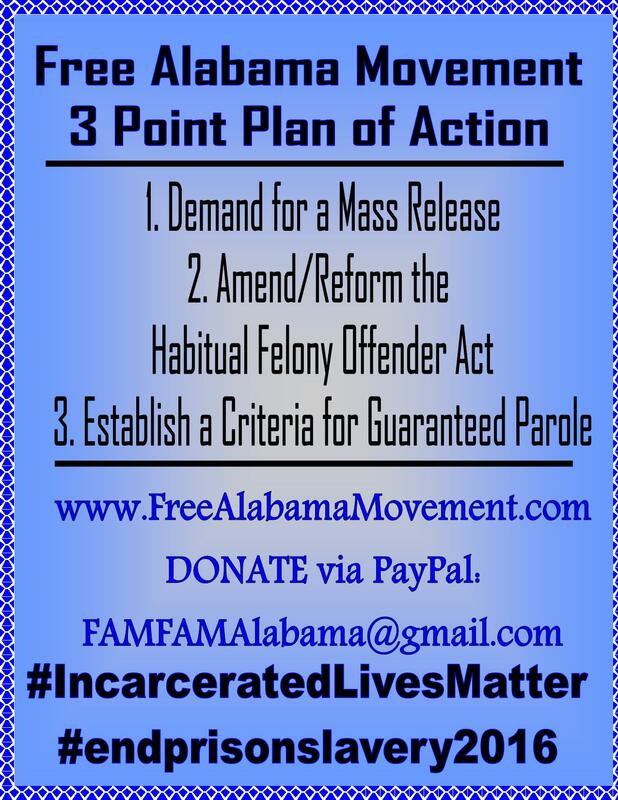 We need to create a “Free Alabama” and “Free Mississippi” speakers’ tour to send activists all over Alabama & Mississippi United to spread the message about the conditions in Alabama’s & Mississippi’s prison systems. This is the first step to a regional and national campaign, but we need to win the people in Alabama & Mississippi over, and not just activist organizations or so-called leaders. 2. 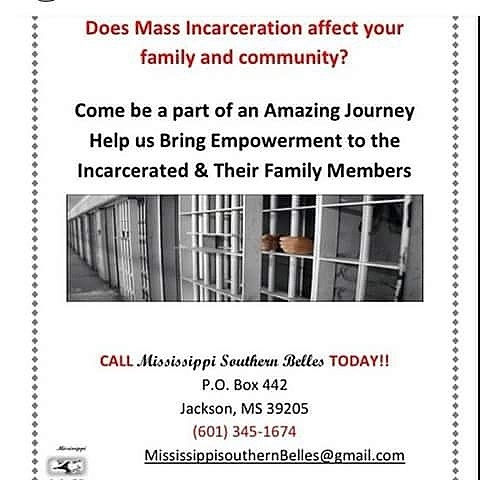 We need to have a series of mass meetings in Birmingham, Selma, Pritchard, Anniston, Montgomery, Decatur-Huntsville, Tuskegee, Enterprise, Troy, Bessemer, Collegeville, Foley and others in Alabama, and Clarksdale, Gulf Port, Greenville, Jackson, Hattiesburg, and Parchman in Mississippi to expose the conditions in these state prisons, to educate and organize communities of color especially, as well as all others opposed to structural racism represented by this system. 3. 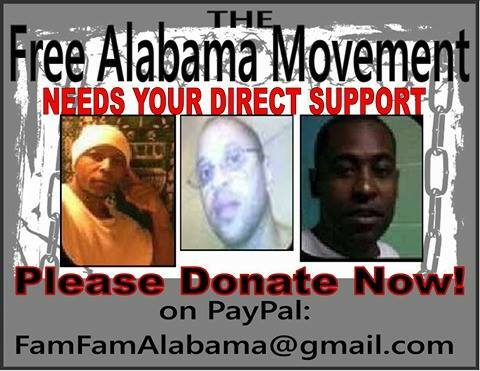 We need to call for a mass international email campaign about conditions in Alabama and Mississippi prisons, backed up with pictures, videos, and firsthand account interviews from the men and women incarcerated in these (and other) States. 4. We need to build a coalition with other Movements around the world that address issues concerning mass incarceration and prison slavery, including political prisoners, civil and human rights violations at immigration detention centers, private prisons and divestment programs, solitary confinement, juvenile rights, mental health, and the death penalty. 5. Contact HBCU’s and other universities (Yale, Harvard and other Ivy League schools are currently doing demonstrations on campus about solitary confinement). We also need to partner with legal groups about filing a series of class action lawsuits against conditions in Alabama and Mississippi prisons. 6. Go to the United Nations Human Rights Council with a human rights complaint about Alabama and Mississippi prisons being a violation of international human rights covenants. 7. 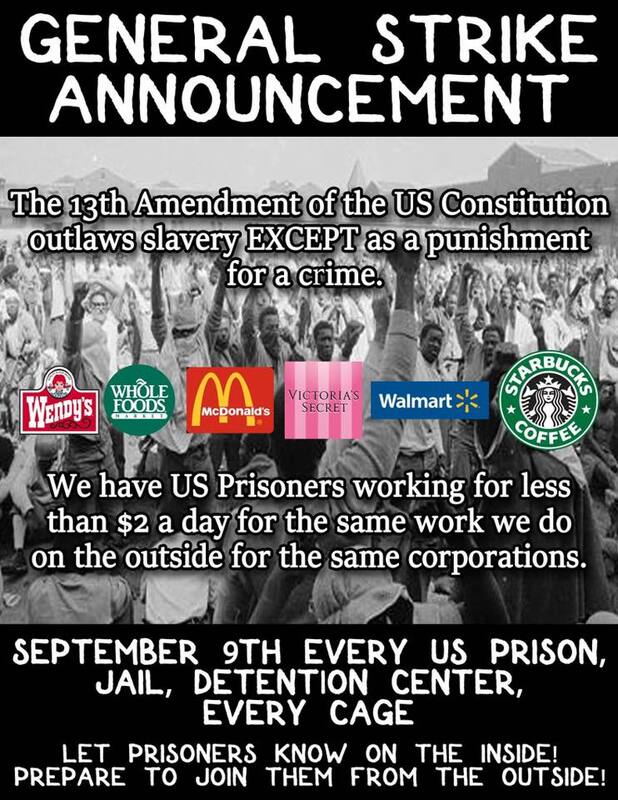 A national protest march in Montgomery, Alabama and in Parchman, Mississippi against prison slavery, as well as continuing picket lines at the Alabama and Mississippi Departments of Corrections. 8. 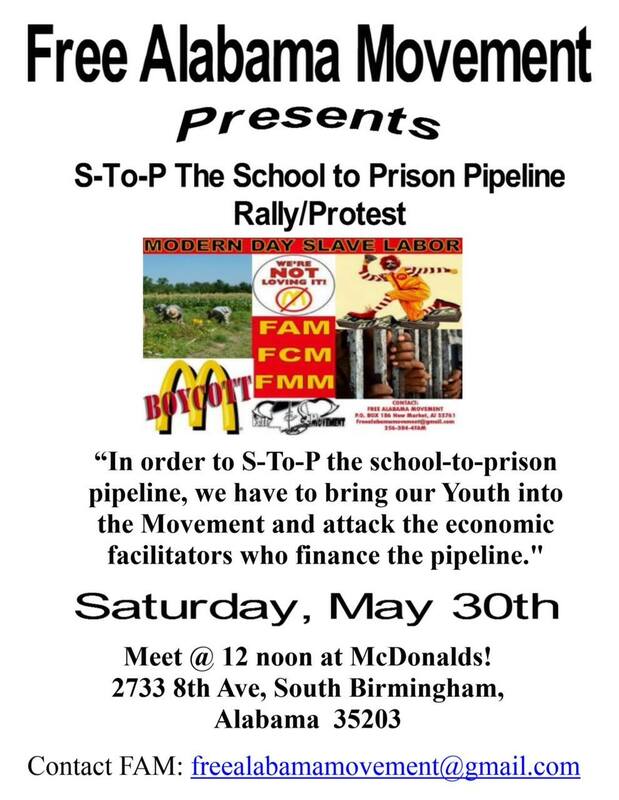 A Southern Regional [or national] Prison Activist Conference (Alabama, Mississippi, Georgia, Florida, Texas, Louisiana), about not only conditions in Alabama and Mississippi, but all over the country. 9. 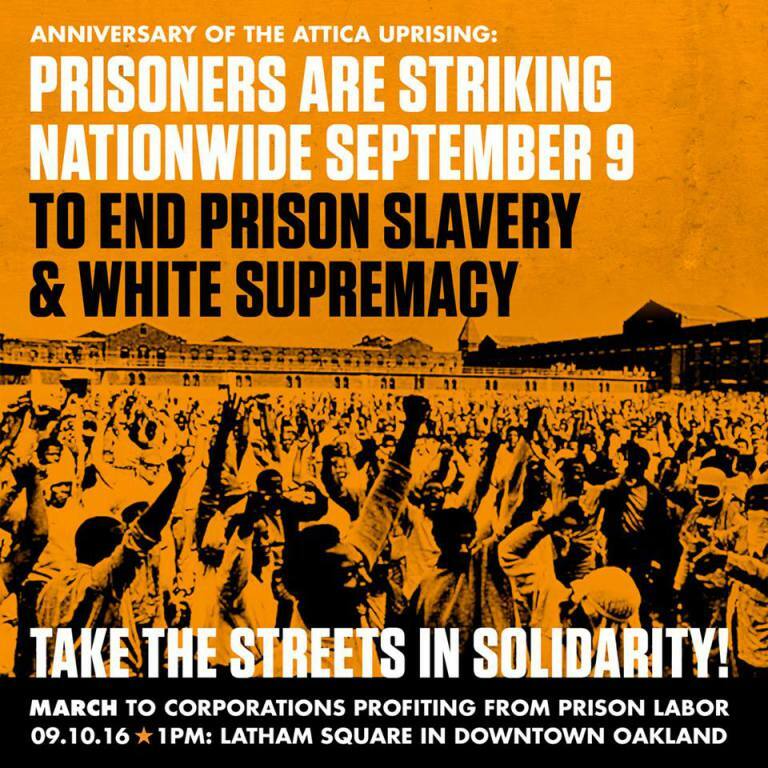 An Emergency Response Network to be able to respond in support of prison strikes in Alabama and Mississippi, or anywhere in the country where work strikes are taking place, and prevent mass repression by prison officials. 10. We need to recruit students, youth, and community activists as volunteers from all over the country. 11. We need to have a massive fundraising campaign on GoFundMe to obtain the funds to make this happen. We should create a joint fundraising committee to handle the funds and make an accounting of all funds raised. Note* A Western Regional base is being developed for California and Arizona. And Illinois is also being targeted for development. FREE ALABAMA MOVEMENT, FREE MISSISSIPPI MOVEMENT, FREE GEORGIA MOVEMENT, FREE FLORIDA MOVEMENT, FREE LOUISIANA MOVEMENT, FREE TEXAS MOVEMENT, FREE CALIFORNIA MOVEMENT, FREE ILLINOIS MOVEMENT, FREE PENNSYLVANIA MOVEMENT, FREE OHIO MOVEMENT, AND MORE . . .
None of us are FREE until we ALL are FREE . 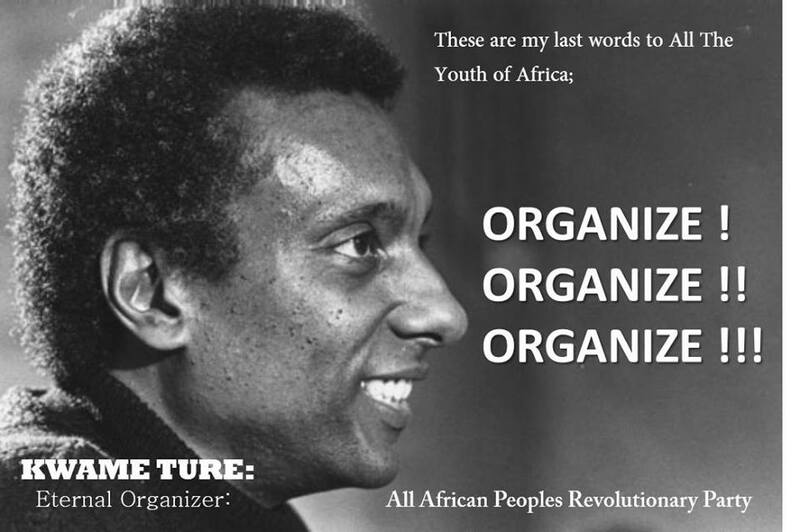 This entry was posted in Activism, Free Alabama Movement (FAM), Organizing and tagged activism, Alabama, Free Alabama Movement, Free Mississippi Movement (FMM), mass incarceration, Mississippi, organizing. Bookmark the permalink.